Growing up, like a typical teenager, I had my far share of jobs. One summer, I made pizzas. Another I was stuffing preprinted sections of the Sunday paper (sale ads, comics, other standard sections) in to "fresh of the press" sections that went out Sunday morning. I'm sure there is a term for that (Night Owl? Little help?). I've mowed lawns. I worked as a cook in a smorgasbord. I've worked retail in a mall. One job I have never had in my life is to work at a grocery store or any other place where rotating the stock was needed. The summer I was a cook someone else had the job of keep the fridge stocked properly for us. I just had to wrap up the food from the night before. But never had to move the old stuff to the front and get the newer stuff in the back. However, I shop in that manner. I'll look behind the stock for a gallon of milk with a few extra days of freshness in it. Or for that loaf of bread that expires at the end of next week instead of the middle. Maybe a can of pineapple that is good until 2018 because I may forget to use the one in the front that'll be all gross and rotten in Sept 2017. But packages - those are the opposite. All the new stuff tends to be in front, and you have to dig to get to the moldy oldie, but exponentially more awesome cardboard in the back. Take these two mailing as examples that are great on each and every card, just that you have to go to the back for the old stuff. Brian over at HSCA sent a small but packed PWE. A lot of late 90/early 00 cardboard was within, and these three plus more made it into the respective years of the Sox box. That dude in the middle? Talk about a nobody. Never heard of Caradonna. Online, he toiled in the Sox farm leagues, making it for 2 games at AAA ball before he gave up the game. Behind all his sweet junk wax was this gem. 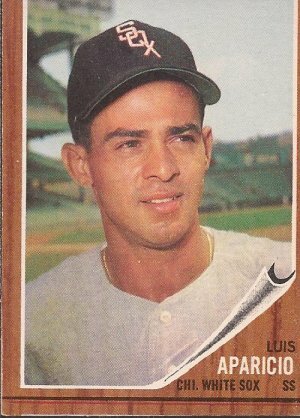 Miscut, but beautiful as a '62 for binder boy Aparicio. It looks great with the rest of his cards I have to this point. Maybe I'll replace it, but I am in no hurry and wouldn't mind if I ever do. Thanks for the mail, Brian. Chris from Old Foul Cardboard (you are running out of excuses not to blog, dude) sent me a few needs off my want list. 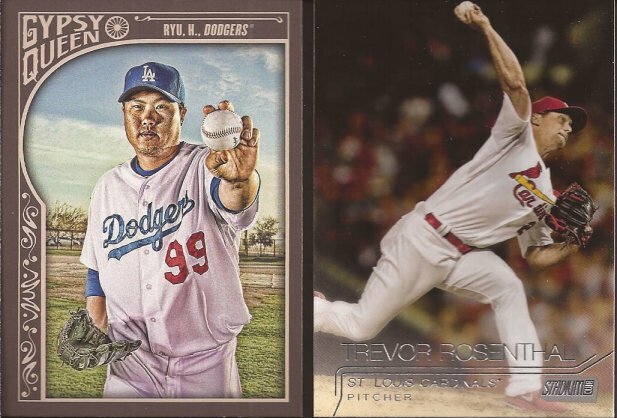 Ryu leaves 2015 GW base at one card remaing, while Rosenthal chipped a bit off of the large needs for 2015 SC. With luck, the right dime dox will come along soon for Stadium Club. Now, I did have to dig past these beauts to get to the old timers. I could easily stop with a Thomas Tek and a gorgeous on card of Paulie from Pristine. I can tell you there is no way that Konerko would be anywhere in my price range around here, so I hope you got a hell of a deal on it. I'm not sure the pattern behind Frank. I would call it "circles", but I am sure some corporate wienie has some complicated phrase he pegged it with, like "oscillating power" or "synergistic fortitude". It's frigging circles. NICE! 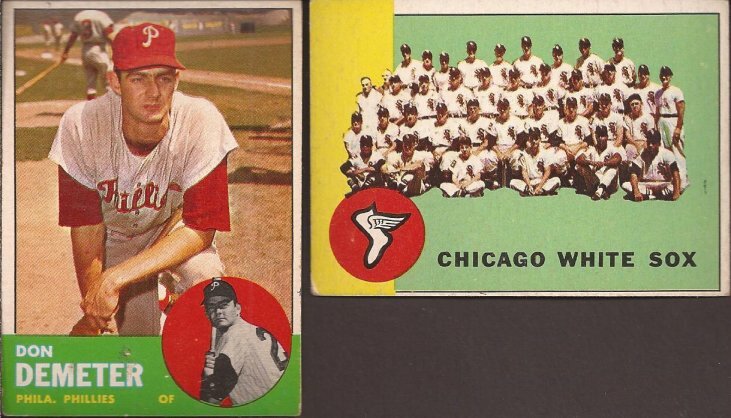 Two '63s - one of the Sox team, which I needed for the Sox binder. The Demeter is a bit confusing. I haven't started building a '63 set, and really wasn't planning on it. Chris said he mistook my '64 as '63. Well, should I decide to build the 1963, I am .00174% complete. YAY ME! But thanks for the card, Chris. 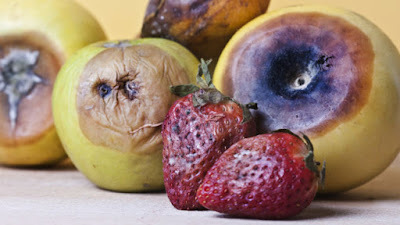 Old? Sure. But vintage still retains all it's flavor these years later, like Twinkies. Not a White Sox fan by upbringing but it's hard not to like Paulie and the Big Hurt. Love the Paulie auto, but the hypnotic background on the Big Hurt has won me over. 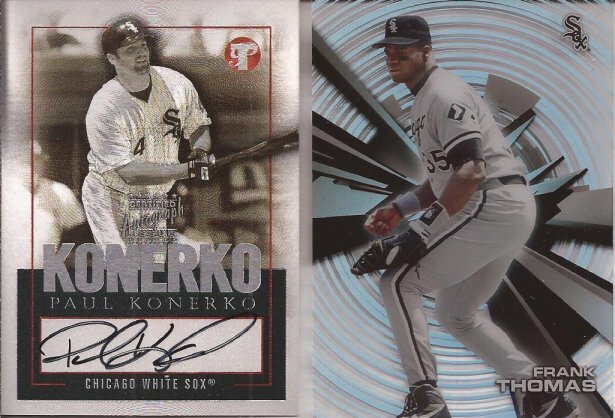 That Konerko is great. I worked in a grocery store through high school and college. You see lots of interesting things for sure. Searching for better dates on food is just being smart. At least you are not opening the bread to make a sandwich. I've witnessed that.